Fitted wardrobe - is it worth it? Fitted wardrobe – is it worth it? Lets be honest, the majority of our homes are bursting with clothes, shoes and accessories. Probably all of us have at least once thought about a bespoke wardrobe that would be made according to your own requirements – the height of the hanging space, the depth of the drawer, the height of shelves etc. Custom fitted wardrobes can also be a great way to enhance the look of your home. Bespoke closets can be customised according to your style and preferences. These wardrobes comes in different types of door styles. For example, hinged door wardrobes and sliding doors wardrobes. Often the wardrobe can make the room look larger. 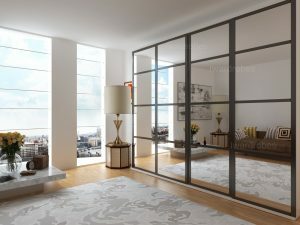 For example, the mirror wardrobe is a great way to make the space look lighter as well. Custom closet offer more storage space. Some people may find the fact that you usually do not take fitted wardrobe with you when you move. But often it also can increase the value of your home. You can customise tiniest detail in your wardrobe. We are all about your choice and fitted bedroom wardrobes are all about you. So you can customise everything. From shoe drawers to bag cabinets. Even the size of shelves and drawers can be of your choice. At I-wardrobes we specialise in modern and traditional designer closets, including bespoke walk-in wardrobes, custom painted shaker closets, fitted sliding door wardrobe and hinged door storage solutions.